Choose up to 13 ways your members can earn loyalty points at your store. Members see the ways they can earn points on the Earn tab of your loyalty widget. When they perform an action that you reward for, they'll automatically earn the points you set. Members earn points every time they make a purchase at your store, encouraging them to shop with you. Choose how many points you want to reward members for every $ they spend. This is the only required point-earning action. Welcome new members and kick-start their earning with points when they create a new customer account. Members can only get rewarded once for this action. 📝 Note: Customers who already have a store account with your store will not have the Create an Account option available to them. Reward members points for giving you their personal details. Build an information-rich member database, including gender and birthday. This is required if you want to reward members on their birthday. Members can only get rewarded once for this action. Grow your Facebook page likes. Reward points to encourage members to like your store on Facebook. Points are rewarded when the member successfully likes your Facebook page and they can only get rewarded once for this action. Grow your Instagram following. Reward points to encourage members to follow your store on Instagram. Points are rewarded when the member follows your Instagram and they can only get rewarded once for this action. Grow your Twitter following. Reward points to encourage members to follow you on Twitter. Points are rewarded when the member follows you on Twitter and they can only get rewarded once for this action. Incentivize members to spread the word about your store. Reward points when members share your store on Facebook. Unlike other loyalty apps where customers simply need to click on this option and don't have to complete the share, points are rewarded only when the member successfully shares your link on Facebook. They can only get rewarded once for this action. 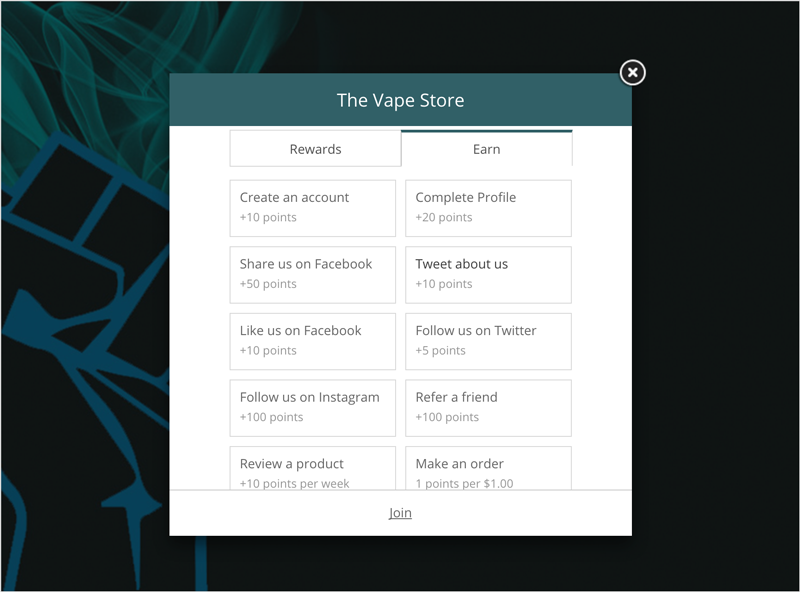 Incentivize members to spread the word about your store. Reward points when members share your store on Twitter. They can only get rewarded once for this action. Create a referral program. Reward members points when they refer a friend who becomes a customer and makes their first purchase. Members can get rewarded for every time they make a successful friend referral. Build a loyal relationship with your members and really personalize their point earning. Automatically send them points to say Happy Birthday and delight them on their special day. 📝 Note: A customer needs to have an account for 1 month before they are eligible to earn birthday points. This is a fraud prevention measure so that customers don't just create accounts and claim birthday points immediately. Sometimes those situations pop up where you think a member might need a little extra loving. You can adjust their points manually and send them an optional email to let them know why. Reward members points when they review your products and choose how often members can get rewarded for leaving reviews. For Shopify: Shopify's free Product Reviews App is required and needs to be enabled. For BigCommerce: BigCommerce product reviews feature needs to be enabled. Have something else in mind? Use Marsello's API to create a customer reward action. This requires you have development knowledge or that you hire a third party developer.